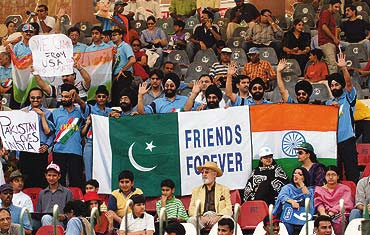 There has been mixed response to the BCCI's decision to host Pakistan Cricket Team in December-January for a limited-over’s series (July 2012). Ex cricketers like Sunil Gavaskar and Kirti Azad are critical of this decision of BCCI, while many others on both sides of the divide have welcomed this idea. Imran Khan, ex-cricketer turned politician welcomed the idea saying that this will pave the path for bringing normalcy to relations between the two countries through negotiation table. For Asif Ali Zardari, the President of Pakistan, this is a step of confidence building between the two countries. As such the relation between these two neighbours has gone through lot of ups and downs. Despite three wars between the two countries, some of the core issues are of such a nature that they cannot be resolved through violence and war, and so these problems persist from so many decades. The South Asian countries, and India Pakistan in particular, inherit the colonial legacy from the past and the problems related to the policy of imperialist power, the United States, at present. Issues like Kashmir, which is leading to massive suffering to Kashmiris, is a big thorn in the flesh, but it can only be resolved through a multi layered dialogue and gradual resumption of the relationship amongst different groups-areas. The current atmosphere of lack of trust, manifested though the VISA policies of both the countries are a good reflection of what should not be there between good neighbours. At present if one wants to visit Pakistan, the VISA is not easy and one is granted a city wide VISA for Pakistan and even then one has to report to the local police after one lands there. Many restrictions are there for those visiting from Pakistan to India. The popular perception in India is that Pakistan is responsible for all acts of terror in India. While in Pakistan many things are attributed to the role of India, its interference in the Pakistan. In India one can see that with the mention of word Pakistan, there is an instant fright descending in the atmosphere. The latest attack of 26/11 is still being investigated and it has caused lot of worsening of the image of Pakistan in Indian psyche. As such right since partition and more so during last three decades these images are mutually negative. The whole politics of oil, as reflected in and around the Afghanistan-Taliban-Al Qaeda, which is primarily the creation of US policy of maintaining dominance in the region for the sake of controlling the global oil reserves, has the accomplice in the form of Pakistan army. The distinction between the US-Army nexus on one side and Pakistani civil society-democratic government is not much realized in India. All charges are attributed to Pakistan in general, leading to a negative feeling here. On the top of that the policies of Pakistan are reflected on to Indian Muslims, who in turn are supposed to be more loyal to Pakistan, an absurd and baseless assumption. This assumption was exploited in a surreal manner by Gujarat Chief Minister Narendra Modi. In the after math of Godhra train burning-Gujarat pogrom, first he attributed the train burning to Pakistan’s ISI and then kept challenging General Parvez Musharff, the then President of Pakistan, who had usurped power from democratic Government, in his speeches. This went to the absurd limits of communal polarization when during the Gujarat elections the hoardings came up with Modi on one side and Musharraf on the other side, as if Modi is fighting election against Musharraf. The underlying message which Modi tried to give was that India is under threat from Muslims as symbolized by Musharrf and Modi is the saviour for Hindus. Musharrf was used as a symbolism for Indian Muslims. This shrewd trick helped the communal forces to consolidate themselves in Gujarat and other places, also leading to the victory of Modi in the post pogrom Gujarat elections. As such there is a growing realization in both the countries that the destinies of both the countries are linked together and it is in their own interests to grow more congenial relations, which in turn will help solve most of the bilateral issues. Surely Pakistan army and the ultra nationalists-communalists in India are against such a rapprochement. Despite this there are many elements that are longing for a peaceful south Asia. In this context the people to people initiatives like Pak-India People’s forum, which keeps linking the citizens of both the countries on many occasions, need to be strengthened. This forum also plays a positive role wherever possible like solving the issues of fishermen who are caught by the sea guards. This is one amongst many initiatives undertaken by this platform of amity and peace. Similarly Aman ki Asha, a joint project between two big dailies, India’s Times of India and Pakistan’s Jang is creating ripples of peace in a slow and sustained manner. As such there is a need to revive the SAARC, the joint platform of South Asian countries for regional cooperation. This platform came up with great amount of hope but seems to have lost steam from quite some time. India-Pakistan are the major players in this arena while the other South Asian countries share a lot of legacy, commonality of problems and their cooperation is in the interest of all of them. In this direction the peace loving individuals of South Asia have been contributing by keeping the links alive through various forums sowing the seeds of hope. Today, this longing for bilateral relations and peace is finding a growing articulation in the civil society in Pakistan as well. Pakistan army, with its own vested interests is averse to such measures of peace, but our hope and wish has to be a stronger democracy in Pakistan, which will surely be looking forward to strengthening the bonds of amity between the two countries. It also reminds us as to how much both these countries are inflating their defence budget, year after year, projecting the threat of the ‘neighbouring enemy’. This inflated defence budget is at the cost of the basic needs of social welfare, which are the dire needs in both the countries. Surely to begin with both the countries not only need to restore the cricket but also take the steps in improving ties in the area of trade, health and education. There is also a dire need to loosen the tightness of VISA regime, which is stifling the bilateral visits of civilians. My Encounters with Healing In The Name Of Jesus!